Mommy and Tee: Baby Names Inspired by Golf! 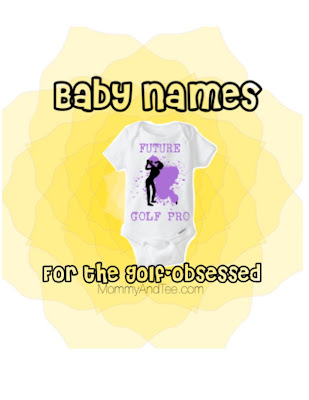 Baby Names Inspired by Golf! Isn't this a cute onesie? You can buy it! The link is at the end of my post. Around our house these days, all we can talk about is baby names. For our second baby due end of year, we decided to start completely from scratch and not reuse any names from the list our first son's name came from. In our early brainstorming phase we really have been reaching far and wide, and anything, no matter how bizarre, is up for discussion. That's led me to making this list of golf names perfect for the baby born to golf-obsessed parents! Ace - The golf term for a hole-in-one, it would be a great middle name for a first born. Augusta - One of America's most beautiful and famous courses is Augusta National, the site of The Masters, one of golf's Majors. It would make a very pretty, classic name for a little girl as well! Albatross - The golf term for a double-eagle, the nick names could be Ross or Albie. It's also the name of a sea-faring bird found near oceans, so there's that. Andrew - St. Andrews, Scotland is the birthplace of golf, and the location for a sort of pilgrimage every golfer wants to take at some point in their life. But there's no need to really explain this name too much to the other parents you'll meet on the playground, as Andrew is a perfectly normal, distinguished name -- a bonus just in case the kiddo grows up and doesn't like golf (heaven forbid). Annika - a sweet name which hits on the popular Scandinavian name trend which also happens to honor the legendary Annika Sorenstam (seriously, my golf idol). Birdie - In golf, a birdie is one under par, and in life I think Birdie would be adorable for a little girl. I imagine a Lady Bird Johnson born to sporty, millennial parents. Links - The oldest style of golf courses are links style, which are all over England and Scotland. I think Links makes a cool middle name, too, for the parent looking for something a little special. Major - the four Majors in golf are the Masters, the U.S. Open, the British Open, and the PGA Championship. While a bit boisterous, it might make a neat middle name. Palmer - The golf legend Arnold Palmer has a long list of accomplishments. And don't forget the refreshing tea and lemonade combo named after him! If you're looking to honor one of golf's GOATs, I personally prefer his last name, Palmer, over his first. Ryder - The Ryder Cup, a match play competition between America and Europe, is one of the most exciting golf events. As a name, Ryder also has a cool edge that will stand out, while still looking good on a work resume as an adult. Torrey - Show your love for West Coast golf by naming your kid after Torrey Pines, one of the most beautiful municipal courses in America. I think it's cute for either a boy or girl! And that's my list of my favorite names inspired by golf. I'm sneaking as many of them into our name conversations as possible. Would you ever name your kid after something in golf? About the onesie in my graphic: I found it on ETSY! Browsing ETSY stores for baby items is one of my favorite time killers. This seller is LittleFroggySurfShop, and you can buy it here.